three different options are offered to discover Beauval during a visit or all year long. At the cash desks, you can pay in cash or by credit card. You can also use these payment methods at the catering points and shop inside the zoo. These prices are subjected to slightly change during the season. * Child price: a document proving the age of the child might be asked at the cash desks. south of the city of Blois, midway between Tours and Vierzon. - 2h15 from Paris through A10, A71 and A85 : Paris, Orléans then Vierzon, in the direction of Tours. Exit n°12 St Aignan. Then follow the road signs to the Zoo. - 1h from Tours through A85. - 45min from Blois through D675. - 1h from Vierzon through A85. 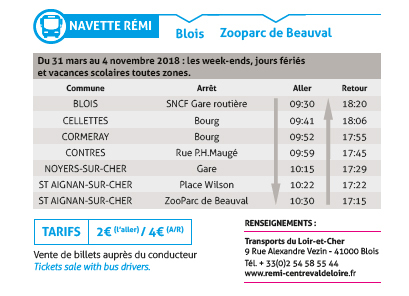 Available from April to November, the coach connection from Blois-Chambord Railway Station to the Zoo of Beauval takes into account the timetable of the SNCF (Paris Austerlitz – Blois trains), and stops at the villages of Cellettes, Cormeray and Contres. Car-sharing to go to the ZooParc de Beauval: an alternative way of travelling, an economical and friendly solution! We have 4 hotels sites near the ZooParc. Each of these establishments welcomes you in an exotic atmosphere! Rooms, family rooms or furnished apartments ... Our 4 hotel structures offer you several accommodation solutions: as a couple, with family or with friends, you will find what you're looking for in Beauval. In addition, take advantage of a package including tickets for the ZooParc at a special rate! The hotel « Les Jardins de Beauval » welcomes you in an extraordinary setting and will delight you with its Indonesian atmosphere. Spacious and decorated with refinement, the rooms are spread within elegant circular pavilions while the outside swimming pool offers nice relaxing moments. “Les Jardins de Beauval” has also a spa, a restaurant and a cocktail bar. The hotel « Les Pagodes de Beauval » invites you to travel with its decoration authentically Chinese. An immersion within the Middle Kingdom that extends in the zen gardens and the lagoon swimming pool… A joyful invitation to relaxation and serenity. The hotel “Les Pagodes de Beauval” has also a spa, a restaurant and a cocktail bar. Located within the center of the medieval city of Saint-Aignan, the residential hotel « Les Hameaux de Beauval » leads family and friends to travel throughout the heart of Asia. Some vast flats of 1 to 3 rooms at the heart of a private garden offer very friendly stays. The hotel « Les Hauts de Beauval » receives you in an African atmosphere. From the African waxed fabrics to the wood of the balconies, everything is thought to offer you a family immersion in the heart of the African Savannah. « Les Hauts de Beauval » has also a restaurant and a cocktail bar. Shows take place from March to November. and « L’Odyssée des lions de mer », featuring agile sea lions! At the heart of a spacious outdoor amphitheater, that can seat 3,000 people, 500 birds fly above the heads of the audience in an amazing choreography. Owls, cranes, pelicans, storks, ibises, marabous and parrots join the air ballet of the birds of prey to give us an unforgettable show with a dazzling finale! In the magical setting of our aquatic amphitheater, fully restored and equipped with a slide and a diving board, agile and playful sea lions show off their dexterity and balance during the show « L'Odyssée des lions de mer ». Throughout the day, our education coordinators meet the visitors in the ZooParc, to inform them about the lifestyle and habits of the species housed in Beauval. The themes and schedules vary according to the season. The ZooParc de Beauval is open every day, all year long, from 9am. A whole day is necessary to visit the 40 hectares of the zoo. We suggest you to arrive quite early on mornings in order to enjoy the best of the animals. Nevertheless, it is possible to do the visit in a smaller amount of time, but a minimum of 5 hours is highly recommended, taking into account the schedule of the bird show « Les Maîtres des Airs », and of the sea lion show « L'Odyssée des lions de mer ». Fast food or self-service canteen, sandwiches or hot dishes : twelve catering places are spread throughout the zoo (for lunch only). They are not open on a daily basis; please consult the information board at the entrance of the zoo or our mobile website. So? On site or take away? the 10,000 animals of Beauval live in the heart of a 40 hectares tree-filled park. 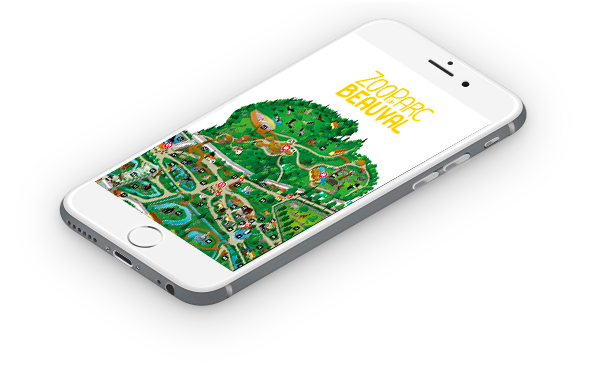 To make your visit easier, download the Beauval ZooParc app! It will help you to guide yourself through the ZooParc and discover many different animal species. The app will answer all your questions: Where are the pandas? How to get to the Hippopotamus area? Are Asian otters near my location? Thanks to the app, moving in the zoo will become a child’s play! So, don’t wait to download it, and go like the wind to the most remoted places of the park! Better than a compass ! - Check out the zoo's location map to get around easily. Animals, toilets, catering points, shops, etc. You will find everything you need in a snap! - Take note of Beauval's current events on the home page. - Find all information on species via the home page or the landmarks on the map. Stories and anecdotes are to be discovered about Huan Huan, Asato, Sherkan and about others animals of Beauval. - Optimize your visit by creating your own personal journey. The must of the app! To do that, you just have to select the animations, the shows and the animals you want to see. The app creates a special program for you, so you’ll be sure not to miss anything. What can I do in a few hours or when it rains? Tours are also available to guide you in the zoo. - Check the shows and animations schedules. You can even program reminders to be sure not to forget anything! - Listen to our « ZoodioGuides » to learn more about animal life! a lot of services are provided for the visitors of the ZooParc de Beauval. Eight free car parks (4 000 parking spots), one of them dedicated to motor homes, are located nearby the zoo. Some parking spots are dedicated to disabled people, and others are also made for bicycles and motorbikes, at the entrance of the main car park. - Next to the catering spots, some micro-wave ovens are at your disposal to heat meals for young children. - Large playgrounds, adapted to different ages, are located nearby the catering places « L'Eucalyptus » and « Le Kilimandjaro ». A carousel is also settled on the terrace of « L'Eucalyptus ». Most of the park is accessible to disabled people, except for certain alleys with a hard slope, that are indicated on site and on the visitors’ map that will be given to you at your arrival. For the amphitheaters, some access ramps lead to spaces dedicated to wheelchairs. Guide dogs and assistance dogs are allowed inside the zoo. Only the tropical hothouses and the Chinese area are forbidden to them and will have to be visited alternately: while the dog is kept outside of those areas, his owner can visit them with one of his companions, and then keep the dog outside. - Some audio and text presentations on a selection of species are available in English via QR codes that you can flash inside the zoo. The tree-lined alleys of the zoo are shady and full of benches that allow frequent breaks. The two shows of Beauval are to be discovered from amphitheaters with many seats. Picnics are forbidden inside the zoo. A 300 seats area, with benches and tables is at your disposal on the car park. It is possible to enter the zoo and go out to have picnic, but you absolutely need to get a stamp on your way out of the shop. A cool break for visitors ... Next to the terrace of the “Kilimandjaro” restaurant, the Chinese area and the chimpanzee island, large facial misters cool kids and adults during their summer visit of the ZooParc. When temperatures are rising, do not hesitate to stop there! Lockers are available at the entrance of the Zoo. It is necessary to bring a coin of €0.50 to close them. The zoo is not a strolling place for dogs and pets. Therefore, we strongly recommend you not to visit the park with them. For more information, please contact us at 0033 254 755 000. Whatever the weather is like, it is always nice to visit Beauval. When it’s raining, a lot of shelters are still accessible, especially the four wide tropical hothouses of the zoo. When it is very hot, visitors will enjoy the various shady alleys and watering places that punctuate the park. Depending on the climatic conditions, some animals may choose to go in their inside bedroom areas but will remain visible through the bay windows. Two shops offer a lot of products linked to the ZooParc de Beauval and to wildlife conservation. cuddly toys, books, DVD's, stationery, textiles, bags, games, jewels, collection's medals... Many souvenirs and ideas for gifts!!! Open from April to November and located at the entrance of the zoo, a tourism information point offers a great range of documentation in order to discover the cultural and heritage treasures of the region. A first-aid member of staff goes all over the ZooParc and provides primary care. If need be, he will be quickly alerted by the field workers (catering workers, zookeepers…).